Phase refers to whether a substance is a solid, liquid, or gas. Understanding what, on the molecular level, affects a substance's phase and how a substance goes about changing from one phase to the next is necessary for the SAT Chemistry Test. This chapter will deal with both the qualitative and quantitative aspects of phases and phase change, as well as the behavior of gases. It will include discussions of the ideal gas equation, partial pressures, intermolecular forces, phase change and phase change diagrams, and vapor pressure. Theoretically, all matter becomes gaseous if its temperature exceeds its boiling point, no matter how high or low that boiling point may be. For the SAT Chemistry Subject Test, you should be familiar with certain characteristics and properties of gases. Let's start by looking at these gas molecules moving around in a box. The molecules are moving, banging and bumping against one another and against the walls of the box in every which way. Because they bang into the walls of the box, they create pressure against the walls. When we talk about pressure, in relation to gases, we're talking about the amount of force the gas particles are exerting on the walls of their container, per unit area of the container. As we've said before, we measure pressure in torr or in millimeters of mercury (mmHg) or atmospheres (atm). Each of these units represents a unit of force per area, and 760 torr = 760 mmHg = 1 atm. All of the gases you'll see on the SAT Chemistry Test are assumed to be ideal gases. Molecules of an ideal gas do not attract or repel each other. Molecules of an ideal gas occupy zero volume. No gas ever acts completely as an ideal gas. In real gases, molecules attract each other slightly, which causes them to strike the walls of their container with slightly less force than ideal gases. However, most gases (especially lighter ones such as hydrogen and helium) under typical temperatures and pressures act enough as an ideal gas to make the concept useful. In order to succeed on this test, you've got to know the relationships that exist among the temperature, volume, and pressure of an ideal gas. Pressure and Temperature Suppose we start with a 3 L sample of gas at 200 K and a pressure of 900 torr. If we raise the temperature to 400 K without changing the volume of the container, what will happen? Because we doubled the temperature, the pressure will double, too—;to 1,800 torr. In other words, if volume doesn't change, then pressure is directly proportional to the temperature in degrees Kelvin. Why is that? The increased temperature provides the gas molecules with more heat, which is converted to kinetic energy, which means, basically, movement. The molecules start moving faster, and if they're moving faster, they're hitting the walls of the container harder, and that increases the pressure. The technical term for this phenomenon is kinetic molecular theory, which states that the kinetic energy of a gas molecule increases proportionally with temperature in degrees Kelvin. Pressure and Volume Now suppose we start with the same 3 L sample of gas at 200 K and 900 torr. Imagine that, without changing the temperature, we suddenly increase the size of the container to 6 L. We've doubled the volume of the gas, and we haven't changed the temperature. What happens to the pressure of the system? It goes down by one-half, to 450 torr. Here's why. The gas molecules have just as much kinetic energy as they had before, but they've got twice the volume in which to move around. Thus, gas molecules will hit the container walls less often, exerting half as much pressure. When there's no change in temperature, volume and pressure are inversely proportional. Triple the volume, and you'll cut the pressure to one-third of its original value. Cut the volume by one-half, and you'll double the pressure. The relationship among pressure, volume, amount (moles), and temperature of an ideal gas is given by the ideal gas equation, PV = nRT. On this exam, the ideal gas equation is practically all you need to answer questions about gases. Let's start by talking about R—;the ideal gas constant, which is equal to 0.082 (you don't have to remember that number for the test). • Values on the same side of the equation are inversely proportional to each other when the other variables are held constant. • Values on opposite sides of the equation are directly proportional to one another when the other variables are held constant. If you have a container filled with more than one gas, each gas exerts a pressure. The pressure of any one gas within the container is called its partial pressure, and all of the partial pressures add up to create the total pressure inside the container. • nitrogen's partial pressure is (0.50)(500) = 250 torr, and 100 + 150 + 250 = 500 torr. If you know the ideal gas equation (PV = nRT) and what you've just learned about partial pressures, you'll be in good shape when the test asks you about gases. Now try these. Answers can be found in Part III. Questions 10–12 refer to the following. 61. Four grams of helium are in a sealed, 2 L container. If helium were a true ideal gas, how would its behavior differ from its actual behavior? (A) Its molecules would attract each other. (B) Its molecules would repel one another. (C) Its molecules would be in continuous motion. (D) It would exert more pressure on the container walls. (E) It would exert less pressure on the container walls. 62. A closed mixture of helium, hydrogen, and carbon dioxide gases are at a pressure of 1,200 torr in a 4 L container. There are a total of 24 moles of gas molecules in the container. If the helium concentration is 2 moles/L and the hydrogen concentration is 1.5 moles/L, which of the following expresses the approximate partial pressure of the carbon dioxide in torr? The attractive forces that exist between water molecules (shown above) are a special type of intermolecular force called hydrogen bonds. Hydrogen bonds occur whenever hydrogen is bonded to F, O, or N. These are the three most electronegative elements, and as such, they “hog” electrons so much that the hydrogen bonded to them are essential naked protons, unshielded on the side facing away from the bond. This positive, naked proton, is attracted to the negative charge around an F, O, or N in a hydrogen bond. Hydrogen bonds are stronger than any other form of intermolecular attraction, yet they are far weaker than any covalent or ionic bond. The relationship between a substance's average kinetic energy and the strength of its intermolecular forces is responsible for determining if the substance will be a solid, a liquid, or a gas. In a solid, a substance's intermolecular forces are much stronger than the average kinetic energy of its molecules. As a result, molecules are restricted in their ability to move about. These strong intermolecular forces permit molecules to merely vibrate in place. This gives a solid its definite size and shape. In a liquid, intermolecular forces are still more significant than the kinetic energy of molecules. However, molecules in a liquid have enough kinetic energy to move past each other. This allows for the liquid's ability to flow. Despite being able to move about, molecules in a liquid are still confined within the sample. The relationship between intermolecular forces and molecular kinetic energies is vastly different in a gas. Molecules in a gas are so energetic that they easily overcome intermolecular attraction. Gas molecules spread about to fill the volume of whatever container they are in. So when you boil water, what really happens? Adding heat to the water increases the kinetic energy of water molecules. At the boiling point, molecules have become energetic enough to overcome the intermolecular forces between H2O molecules. This allows them to enter the gaseous phase. When steam condenses into water, the opposite occurs. Molecules lose energy to the point that intermolecular forces become significant, bringing them close together and limiting their movement. Notice that changes of state involve intermolecular forces and not covalent bonds. For the SAT Chemistry Subject Test, you may need to know about something called a network solid. No, it has nothing to do with television. Network solids are covalently bonded substances that do not consist of individual molecules. 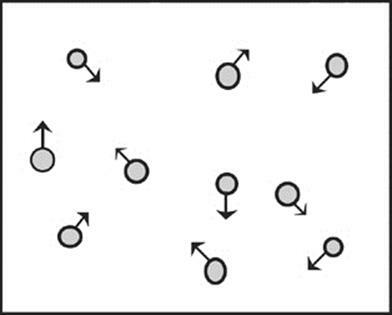 Instead they consist of atoms joined to form molecules that attract each other through intermolecular forces. So, in a sense, the substance is one giant molecule. For this reason, network solids are sometimes called macromolecular substances. Since covalent bonds are much stronger than intermolecular forces, network solids are extremely hard to melt. Diamond (pure carbon network) and quartz (SiO2 network) are examples of network solids. Keep in mind that not all solids are network solids. There are actually four types of crystalline solids: ionic, network, molecular, and metallic solids. Each type of crystalline solid is held together in a different way, which means each has unique properties. 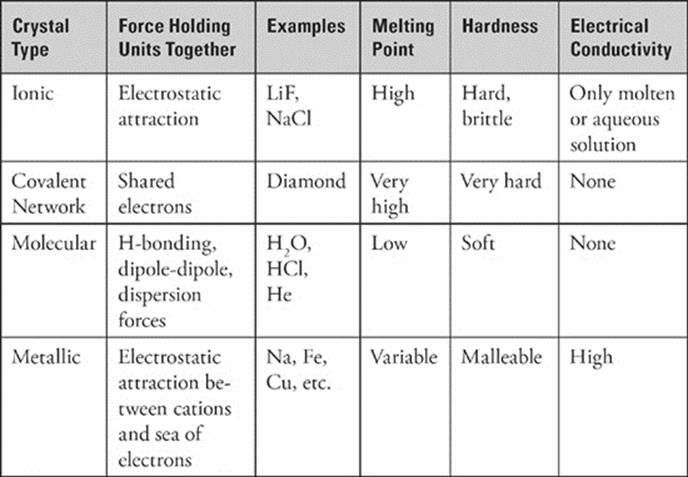 The table below summarizes some aspects of these solids that you should know for the SAT Chemistry Test. Do I Need to Know About Hydrates? Yes, but they're nothing you can't handle. A hydrate (or hydrated salt) is an ionic substance in which water molecules bond to the ions in a fixed ratio. For example, in copper sulfate pentahydrate, the ratio is given by the formula CuSO4 • 5H2O. Anytime you see “• H2O” in a formula, you're looking at a hydrate. You might need to determine the percent composition of water in the hydrate (called its water of hydration). If you do, you simply multiply the molecular weight of water (18 amu) by the coefficient that precedes H2O in the formula. For example, for a unit of CuSO4 • 5H2O, the formula weight is approximately 64 + 32 + (4)(16) + 5(18) = 250 amu. The percentage of water in the hydrate is about × 100%, or 36%. We refer to the condition of being a solid, liquid, or gas as being in a particular state or phase. Whether a substance is in one phase or another depends on temperature and pressure. H2O, for instance, turns from solid to liquid or from liquid to solid at 0°C and 1 atm. It turns from liquid to gas or gas to liquid at 100°C and 1 atm. When a substance turns from solid to liquid, we say it melts. When it moves in the reverse direction—;from liquid to solid—;we say it freezes. So when we think of H2O at 1 atm, we say 0°C is the melting point or freezing point: the temperature at which it melts or freezes. When a substance turns from liquid to gas, it vaporizes; when it goes from gas to liquid, it condenses. When we think of H2O at 1 atm, we say 100°C is the boiling point, which means, generally, the temperature at which it vaporizes or condenses. You should also be aware of sublimation. This is the process in which a solid turns directly into a gas. Dry ice (solid carbon dioxide) does this when it is exposed to room temperature. Above, we've shown the phase change diagram for some substance at some pressure. You might very well see a phase change diagram on the SAT Chemistry Test, so you should understand what information they might give you. Starting from the lower left, we see that, as heat is added to the substance, its temperature rises. Moving left to right, we reach the first plateau; that's the substance's freezing/melting point. Notice that the curve is flat for a little while as the substance passes its melting point. In other words, to move from a solid to liquid phase, we add heat—;but for a while the temperature of the substance doesn't change. The heat energy absorbed is used to move the substance from one phase to the next. The amount of heat that it takes a substance to just move from solid to liquid phase—;to just pass through its melting point—;is called the heat of fusion. For H2O at 1 atm, the heat of fusion is 80 cal/g; this means that it takes 80 calories to change 1 g of H2O from 0°C in the solid phase (ice) to 0°C in the liquid phase (water). After the substance melts, if we continue to add heat, the temperature increases until the substance reaches its boiling point. At the boiling point, the substance doesn't change temperature despite the continued addition of heat. The absorbed heat is used to move the substance from the liquid phase to the gaseous phase. The amount of energy that must be added to move the substance from liquid to gaseous phase is called the substance's heat of vaporization. For H2O at 1 atm, the heat of vaporization is 540 cal/g; it takes 540 calories to change 1 g of H2O from 100°C in the liquid phase (water) to 100°C in the gaseous phase (steam). You know that if we add heat to a solid, the temperature of the solid moves toward the melting point. If we add heat to a liquid, the temperature of the liquid increases until it reaches the boiling point. One interesting phenomenon that you should be aware of for the SAT Chemistry Test is that, under higher pressure, it's harder for solids to melt, and it's harder for liquids to vaporize. However, if we reduce the pressure of the surrounding environment, we lower a substance's melting and boiling points. Reduced pressure makes it easier for solids to melt and liquids to vaporize. The exception to this rule is water. Increasing pressure on ice or water lowers the freezing or melting point. 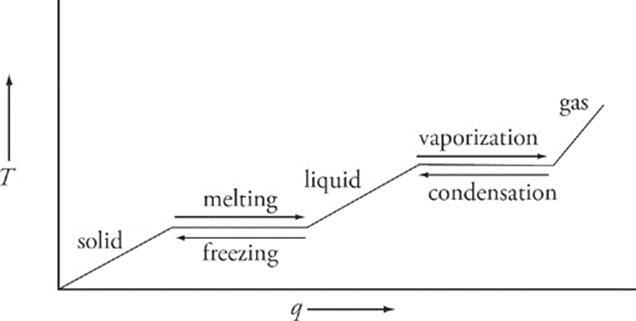 One commonly cited example illustrating the relationship between pressure and the freezing point of water is ice-skating. The pressure of the blade of the skate pushing down on the ice causes the ice to melt. The layer of water that results under the blade allows the blade to slide along with little friction. Most substances tend to want to freeze under greater pressure. Skating is really possible then only on the few substances which share water's property of tending to melt under greater pressure. How come? Just imagine pressure as something that's pushing down on the solid or liquid, tending to prevent its molecules from moving around. If we increase that downward push, melting and boiling are harder to achieve; melting and boiling points, therefore, increase. If we reduce that downward push, melting and boiling are easier to achieve; melting and boiling points, therefore, decrease. In this diagram, each region—;solid, liquid, and gas—;represents the phase that will exist for substance X at a given set of pressures and temperatures. For example, at a pressure of 0.75 atm and 110°C (point A), substance X is a gas. The normal freezing point (at 1 atm) for substance X is 85°C, and the normal boiling point (at 1 atm) is 110°C. Any point that lies on a line on the phase diagram represents a temperature and pressure at which the substance can exist in both phases. For instance, substance X can be a solid or a liquid at 1 atm and 85°C. Point T is a special combination of pressure and temperature called the triple point. At this particular pressure and temperature, the substance can exist as a solid, liquid, or a gas. For substance X, the triple point is at 0.75 atm and 80°C. In general, when a substance is at relatively low pressure and high temperature, it exists as a gas. When it is at relatively high pressure and low temperature, it is a solid. The liquid phase dominates at moderate pressures and temperatures. Keeping these relationships in mind can help you to predict how a change in pressure or temperature will affect the phase of a substance. For instance, if substance X, at 0.75 atm and 110°C (point A) is put under increasing pressure but its temperature is maintained, what phase change will eventually occur? 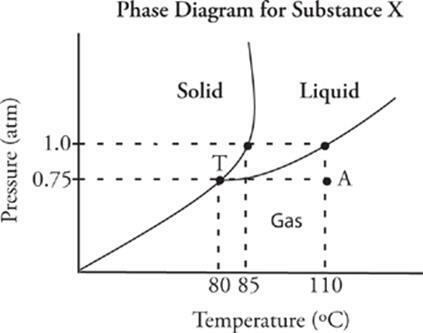 Look at the phase diagram for substance X. Follow the dotted line up from point A (in the direction of increasing pressure). You'll see that beyond 1 atm (at 110° C), substance X will become a liquid. So an increase in pressure at constant temperature will cause substance X to condense. Even if a solid is well below its melting point, a small number of its molecules will always have enough kinetic energy to enter the liquid phase. So when you have a block of ice stored in a freezer, a little bit of it is always melting to form liquid. The molecules of that liquid immediately lose kinetic energy and form a solid again, but right away, a few other molecules gain enough kinetic energy to become liquid. They, too, become solid again after a few seconds. But a few other molecules take their place, becoming liquid, and then solid again. In other words, every solid is always melting—;on the molecular level—;and the molecules that melt are always refreezing. The same goes for liquids. Even if it's well below the boiling point, a few molecules of a particular liquid always have enough kinetic energy to escape into the gaseous phase. This is called evaporation. If they're in a closed system (such as a pot with a lid on it), they quickly lose some kinetic energy and fall back into the liquid phase, only to be replaced continuously by a couple of other molecules that manage to escape. They, too, fall back into the liquid phase to be replaced by other molecules that manage to escape for a few seconds. So a sample of liquid below its boiling point is always evaporating—;a little bit—;and then condensing again (if the liquid is contained). When liquids below their boiling points are evaporating, a vapor pressure is created. All liquids in a closed system, at all temperatures, exert some vapor pressure. But what if the liquid is not in a closed system but is out in the open environment? Here's what happens. A little bit evaporates and is blown away. Then a little more evaporates and is blown or drifts away. Ultimately the whole sample evaporates. If you put a pot of water outside, even at a temperature of 10°C, it will eventually evaporate, although it will take some time. Different liquids differ in their volatility; for instance, if you leave a bucket of gasoline and a bucket of water outside on a cold day—;at a temperature well below the boiling point of either substance—;both will eventually evaporate. But the gasoline will evaporate much more quickly than the water. This is because the intermolecular forces that attract gasoline molecules to each other are weaker than the hydrogen bonds that attract water molecules. Gasoline molecules need less kinetic energy than do water molecules to overcome the intermolecular forces that hold them in the liquid state. Because gasoline evaporates more readily than water, we can say that its vapor pressure is higher, and it is more volatile than water. What other factors besides intermolecular force will affect a substance's vapor pressure? Well for one, temperature: The higher the temperature, the higher the average kinetic energy of the molecules. This means more molecules have enough energy to escape into the gas phase, so there will be more vapor particles and more vapor pressure above the surface of the liquid. If the container is open to the environment, the total pressure above the surface of the liquid must equal atmospheric pressure. The total pressure above the surface is just the vapor pressure plus the partial pressure of the atmospheric molecules. As the substance gets warmer, the vapor pressure increases. Because atmospheric pressure is constant, the partial pressure of atmospheric molecules must decrease. At the point when the pressure above the liquid is all vapor pressure, or when vapor pressure equals atmospheric pressure, boiling occurs. Besides intermolecular forces and temperature, molecular weight also affects vapor pressure. The heavier the molecule, the slower its average velocity at a given temperature, and the harder it is to vaporize. Think about the halogens. 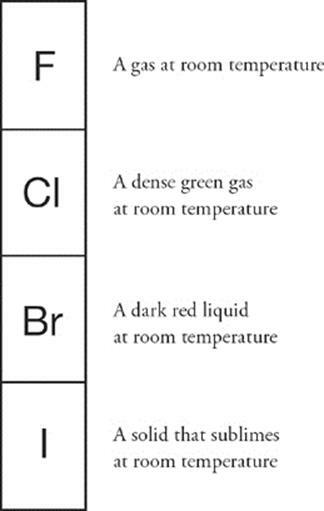 Fluorine and chlorine are gases at room temperature, bromine is a liquid, and iodine is a solid. They have the same valence structure and exhibit the same types of intermolecular forces. Molecular weight accounts for their respective phases. As we saw from the phase change diagram, a substance must absorb heat to change from a solid to a liquid to a gas. It must lose heat to turn from gas to liquid to solid. Heat, as you remember, is a form of energy. So, when you think of phases and energy, remember that among the three phases, solid is lowest in potential energy and gas is highest in potential energy. One more thing: When ice melts, there is an increase in entropy, and when liquids vaporize, entropy increases even more. Under certain conditions, the increase in entropy (which the universe likes) is enough to overcome the increase in energy (which it dislikes) and make a phase change spontaneous. What are these conditions? Well, in the case of melting, if the substance is at a temperature above the melting point, the phase change will be spontaneous. In order for boiling to be spontaneous, the substance must be at a temperature above the boiling point. Review what we've discussed since the last set of questions, and then try the following set. Answers can be found in Part III. Questions 12–15 refer to the following. 52. A 10-gram sample of which substance is held together by hydrogen bonding? · The ideal gas law is PV = nRT. The assumptions underlying this equation are that gas molecules do not experience any intermolecular forces, so they do not attract or repel one another, and that gas molecules occupy volume. · Standard Temperature Pressure (STP) is 0 degrees Celsius or 273 K, and 1 atm or 760 mmHg. One mole of an ideal gas at STP occupies 22.4 liters. · The strength of the intermolecular forces and atomic weight determine melting point and boiling point. The intermolecular forces, from strongest to weakest, are ionic and network covalent, metallic, hydrogen bonding, dipole-dipole, and dispersion. · Phase changes (melting, freezing, vaporization, condensation, sublimation, and deposition) represent a change in the potential energy of the bonds between molecules in a sample. As heat is added to a sample, either the kinetic energy of the molecules increases, or the potential energy of the bonds increases (phase change), but never both. · Heat of fusion and heat of vaporization are the amounts of energy needed to melt or vaporize, respectively, 1 gram of that substance. · The phase of a substance depends on both temperature and pressure, and the relationship between the three (temperature, pressure, and phase). Generally, increasing pressure moves a substance toward the solid phase. H2O is an exception because ice is less dense than water. · Vapor pressure is the partial pressure of vapor molecules that have escaped from a liquid sample, above the surface of that sample. Vapor pressure depends, externally, on temperature alone. It also depends on the intermolecular forces and molecular weight of the substance.